Cooper Roman, an Eagle Scout and Peachtree City resident, recently built and installed four Little Free Libraries on the campus of Christian City. Cooper is pictured with several active senior residents and staff at the library located next to the Dog Park. From left are Cooper Roman, Danny O’Neal, Tyler Wright, Director of Campus Recreation, Arlene White, Gloria Kerns (with her dog Zippy), and Renee Trice. Photo/Larry Regier. 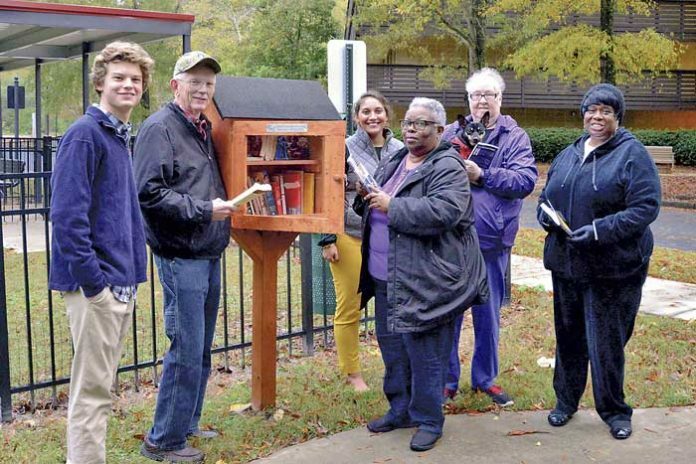 Cooper Roman, an Eagle Scout and Peachtree City resident, recently built and installed four Little Free Libraries on the campus of Christian City. The libraries are located outside each of Christian City’s three Active Senior Living patio home clubhouses and next to the Dog Park.